Beneath the floor of the Mdina cathedral are three large crypts, numerous tombs and various commemorative slabs without a tomb. The two private crypts belong to two ancient Maltese noble families. One of these two crypts can be found beneath the altar of Saint Cajetan. This chapel belongs to the Bologna noble family who had a separate private chapel in the area. When the cathedral was being enlarged after the earthquake the Bologna family accepted to dismantle their chapel on condition that they would retain one of the chapels within the new cathedral with the right to have a crypt beneath the church where the members of the Bologna family would be buried. The areas of the flooring in the cathedral reserved for bishops are the Chapel of Blessed sacrament and the two transepts, the Chapel of the Annunciation and the chapel of St Publius. All the tombstones in the cathedral belong to ecclesiastics with one or two exceptions. 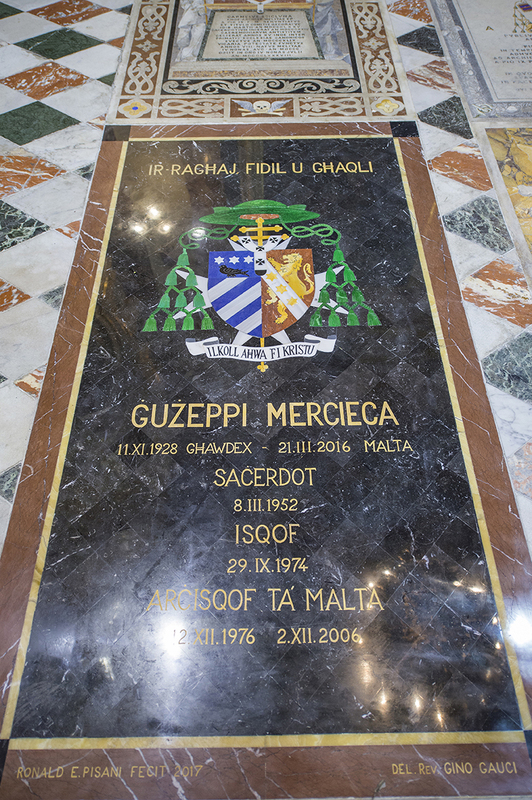 All tombstones have Latin Inscriptions except the one of the late Archbishop Emeritus Bishop Giuzeppi Mercieca which is in Maltese. Information on the tombstones typically includes the person’s name and his service / career to the church . 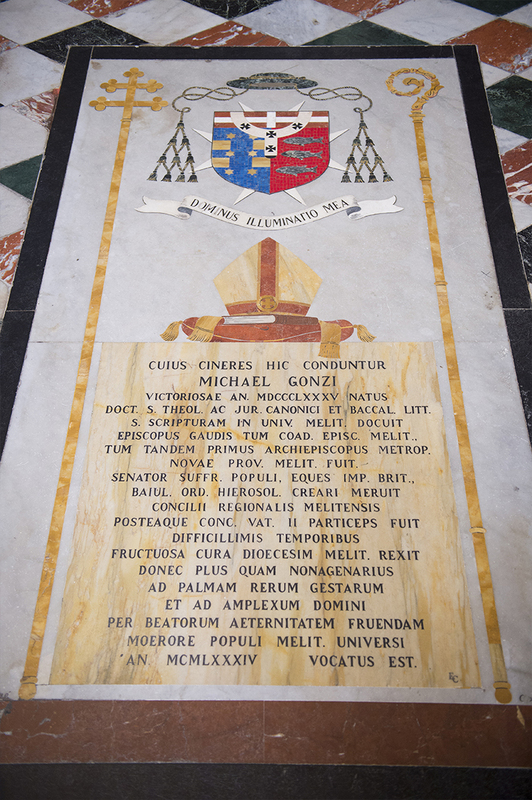 One of the most beautiful tombstones belongs to Monsignor Peter Cavendish who lived in Mdina. Inscribed on it are the words in Latin “This is his second house before the third one” – the first house being his residence in Mdina, the second one being his grave and the third one being heaven. The reminiscent of his name Perter are inscribed the beautiful words of St Peter “ Lord you know that I love you – Domine tu scis quia te amo”. The inlaid marble tombstones were all paid by the individuals themselves during their lifetime, some of whom would choose the design even before their death or by their families. The design would be passed on to the cathedral Chapter for approval, and once the go ahead is given by the chapter a master marbler would be assigned to produce the tombstone. 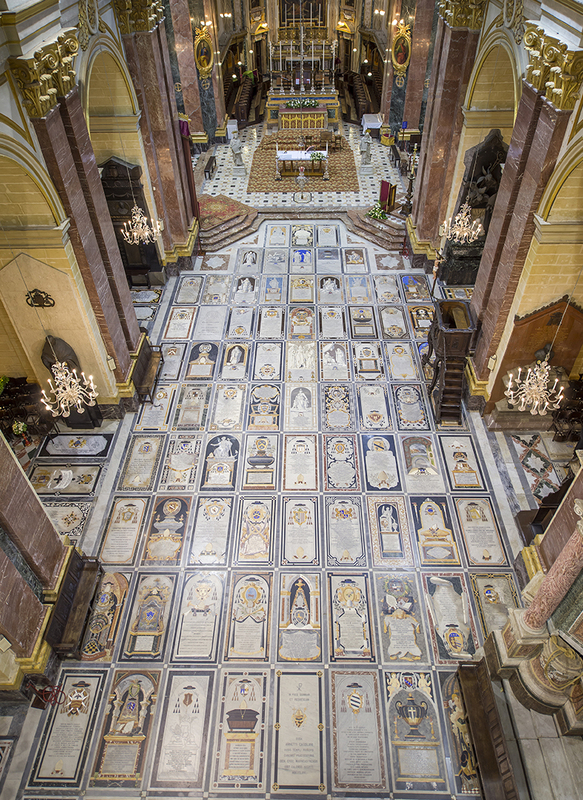 Around 50 years ago the Government of Malta changed legislation not to allow any more burials in Churches. Two special permissions were obtained: one for Archbishop Michael Gonzi and the other for Archbishop Joseph Mercieca.